You Had Me at Anti-Cellulite.. Body wraps are all the rage right now, and guess what? They really work! Summer is upon us so if you're looking for new services, treatments using words like firming or anti-cellulite basically sells itself. Simply blend Lotus Touch Professional Seaweed Powder and apply using a body brush, wrap your client using a multi-layer approach, remove Lotus Touch Professional Seaweed Powder, and finish the treatment with a light massage using Lotus Touch Organic Naturals Massage Lotion blended with Lotus Touch Cellulite essential oil blend. With these fabulous results, the client will be hooked. AND you can retail Cellulite essential oil blend between treatments. Don't Just Wash Your Linens, Clean Them! 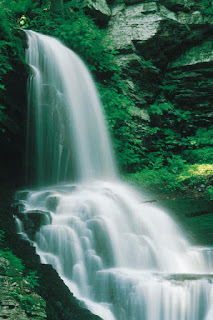 Effectively cleaning your Spa Linens and Towels can sometimes be challenging since most detergents aren't formulated to break down oils, lotions and other commonly used products in salons and Spas. Pure Spa Direct confidently carries and recommends 2 products that will prolong the life of your expensive linens and towels: Lotus Touch Always Fresh Laundry Detergent and BREAKTHROUGH Detergent! Lotus Touch Always Fresh Laundry Detergent comes in a 1 gallon container, and costs only $19.90! This professional-strength, PH balanced, biodegradable detergent is specifically formulated to break down oils, eliminate stains, and neutralize odors. 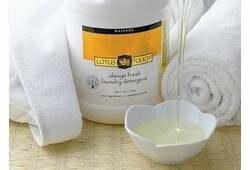 Lotus Touch Always Fresh Laundry Detergent will give your linens and towels a spring fresh smell and feel! For all you salons and spas that are constantly running out of detergent, BREAKTHROUGH Detergent is the product you've been looking for! This incredible detergent comes in 40 pound container and you only need to use 3 oz. per load! You can safely clean and brighten your color and white linens and towels in home and commercial machines. BREAKTHROUGH Detergent utilizes oxygen stain removal properties to efficiently and effectively remove oil and protein stains. No pre-treating or rewashing required for this miracle detergent to work! 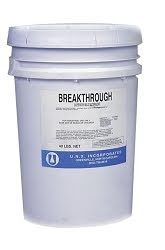 BREAKTHROUGH Detergent was designed to eliminate damaging chlorine bleach, giving your towels and linens a longer and cleaner life! BREAKTHROUGH Detergent suggests using the longest wash cycle available and is effective at low temperatures & all water types. Cleans and brightens colors and whites. Finally your towels and linens can be cleaned, not just washed!